We can't forget to take a look at the gentlemen's stand-out fashions at the 2014 US Open. GlamSpinTennis was eagerly anticipating the return of Rafael Nadal's sleeveless kit, but was horribly disappointed when Rafa withdrew from the tournament. 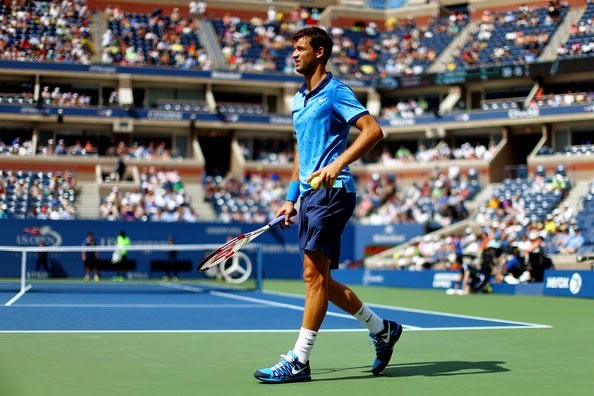 In Nadal's absence, Grigor's blue-on-blue kit was the king of Queens (....Queens, NY) for Nike men. 2014 provided Asics with redemption after the 2013 Roland Garros fiasco. 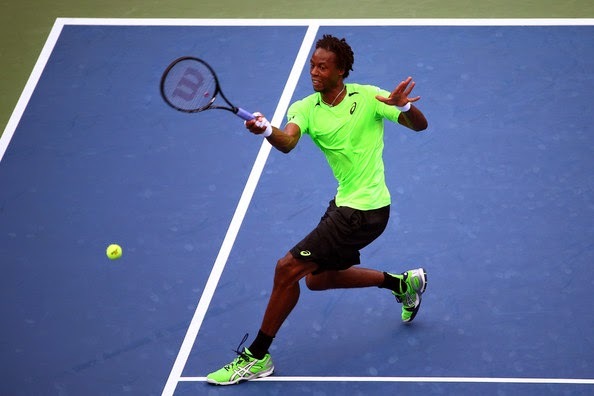 Gael Monfils looked young andfun in his matching lime green outfit. LaMonf looked good during his strong run through the tournament (notwithstanding his shocking exit after holding match points versus Roger Federer) and we hope that the Asics team and Gael can find the way to win a major title in 2015. 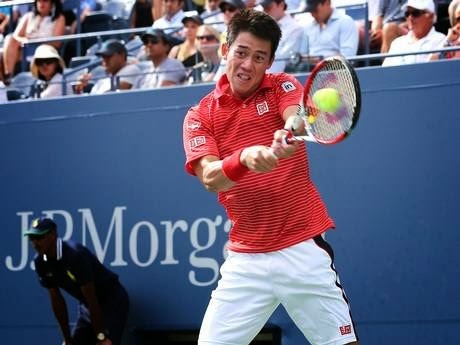 Kei made it all to way to the finals at the 2014 US Open, losing in straight sets to Marin Cilic. His red-white-and black Uniqlo kit stood out for its stylish fit and subtle use of stripes and piping. 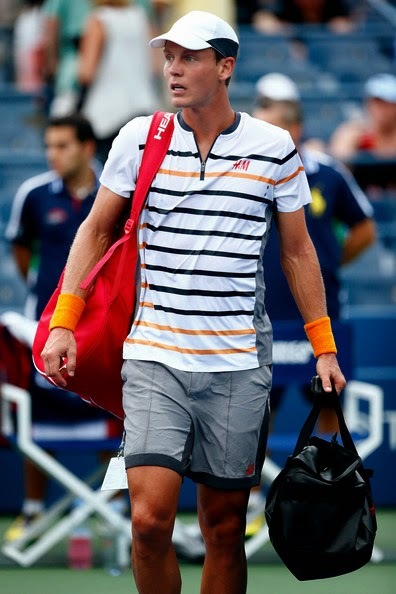 H&M brought its A-game to NYC and outfitted Tomas Berdych in well-fitting duds that oozed sartorial flair. A mayor improvement for the Swedish design shop at the final major of the year. Here's a closer look at some of H&M's previous tennis designs. Two thumbs up (or rather, sideways?) 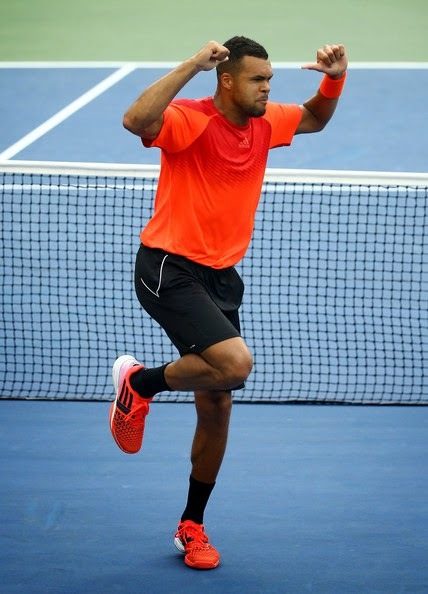 for Tsonga's bold, statement-making, red-and-black outfit.